Kidlington Chess Congress 2019: last year I had a lot of very long games, which I found rather tiring but enjoyable. Still, I wasn’t going to complain this year if some of the games were a little shorter. 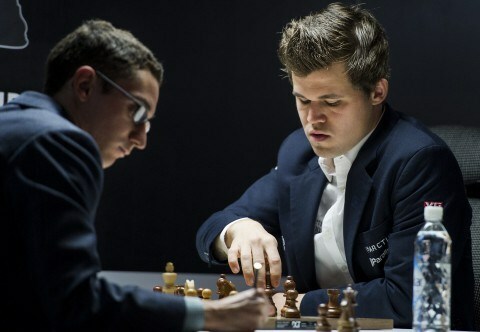 Fabiano Caruana and Magnus Carlsen. Not playing at Kidlington this year, strangely. Round One: I started off with Black against a higher-rated opponent. He played slightly inaccurately in the opening and I spotted an opportunity to equalise: I think the game was always destined to be a Draw after that, neither of us willing to take any risks in the first round. Also a short game at “only” 2.5 hours! Round Two: Paired with a very highly-rated player, previously extremely highly-rated, playing White. The game was progressing well, he had a slight edge, then I managed to equalise. Then he found a good attacking resource to sacrifice knight & bishop for rook & two pawns. This was well-judged on his part because my minor pieces were too loose to consolidate. Well played, so ultimate I Lost this one. ran low on time and it looked like fizzling out into a draw (or worse if I was unlucky), but I set one final trick. Fortunately for me, this one worked and I was very pleased to Win this one before heading home for a well-earned sleep! Round Four: Day Two started with a game with White against a similar-rated opponent. I didn’t play the opening correctly and got a very passive position where I just couldn’t find moves to play which didn’t make my position worse! I ultimately found a way to create a bit of play, but my opponent’s counter-attack was very well played. Shame to have Lost this one. Round Five: Another game with Black against a similarly-rated opponent. He played an opening I was unfamiliar with and I spent most of the game feeling under extreme pressure. He played a sacrificial attack and I was sure I was on the point of losing. I was grasping at ‘only moves’ to escape, so he kept sacrificing more material. In the end it was too much and I finished the tournament (again) with a Win which is great, psychologically-speaking. Curiously all my points in this tournament came with Black: I scored 0 out of 2 with White, but 2.5 out of 3 with Black. So overall 50% which is my usual target: tournament grade is 160 which is pretty good (above my listed 149 at present). My own game annotations are now available. Also the results crosstables. This was the tenth occasion I’ve played the Kidlington Chess Congress: I had a good year last year and was hoping for a repeat performance. As it turned out, not quite as good as last time, but not as bad as That Year We Don’t Talk About (2016). I played some incredibly long games and it was a rather tiring weekend, but enjoyable nonetheless. 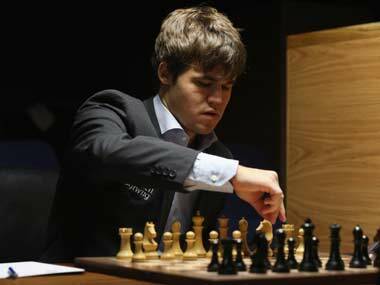 Magnus Carlsen. Not returning my emails. Round One: This game with White against a higher-rated opponent started well. I played my favourite London System and an opening inaccuracy from my opponent gave me a very slight edge. Unfortunately I missed the opportunity to take full advantage and blundered a piece. With time trouble approaching, my opponent returned the favour. We then played on to move 86, I had been playing on increment since about move 35! I was always on the defensive in the endgame and, despite throwing a few tricks out, there wasn’t much I could do. My opponent played well and so ultimately this one was Lost. I was very tired after playing on increment for the final hour of the game, the next round due to start only 40 minutes later. Round Two: With barely a chance to draw breath after the first game, I wolfed down a quick bit of lunch, then we were playing again. Here I was playing Black against a slightly higher-rated opponent. I tried to simplify early on in the hope of having a shorter game. However, the game still went out beyond three hours. I sacrificed a pawn for a good initiative and got a strong passed pawn. I nearly blew it as time trouble approached, but my opponent miscalculated in his own time trouble. Very pleased to Win this one. Round Three: The evening game found me playing White against a very strong opponent, although he’s someone I’ve played and beaten previously. We played the opening very quickly and swapped off lots of pieces. It looked like we were both going to settle for a quick draw, but then he changed his approach. Maybe he realised how many grading points he’d lose by drawing against me. I started playing rather too slowly in an attempt to force the draw and soon found myself worse. In a repeat of my first game, I played for nearly an hour on increment and once again tried to scatter a few banana skins in my opponent’s path just for a chance to avoid defeat. He played very exactly and deserved the win in the end. I was disappointed to have Lost this one, especially since it was another very long game. Round Four: Day Two opened with another game against someone I’d played previously, this time I was Black and looking to improve on my current 1 out of 3 score. Annoyingly, it was one of those games with lots of complications where, after the dust settled, I just had a slightly worse position. My opponent played very well, though, and deserved the win. I was somewhat despondent at having Lost despite not actually playing particularly badly. Round Five: The final game of the weekend drew me against a 9-year-old boy rated the same as me. One of those no-win situations, psychologically-speaking. One half of my brain was saying “He’s only nine, how hard can this be?”, but the more rational half was telling me: “He’s just as strong as you, might be improving quickly and probably won’t have found this weekend as tiring as you!” So I played the London System as White again and quickly found myself in a very nice position. I think he was just unfamiliar with it and didn’t realise how strong a King-side attack can result from such positions. So after less than 90 minutes I was able to play a very pretty sacrificial combination leading to checkmate on move 26. A very satisfying Win to finish the tournament! Also available are full results from the tournament and my own annotations for the games I played. After last year’s disappointing results, things could only get better. Or at least I hoped so. I’ve really had trouble in years past getting good positions out of the opening and so I made a concerted effort to fix this: given limited time, I decided to learn the London System which is not overly-ambitious for White but is usually at least pretty solid. Fortunately for me, this proved to be a great decision and helped me win two games with White and, nearly, one with Black against the same system. For once in my life, my opening preparation was a success! 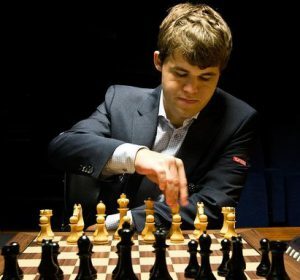 Magnus Carlsen. Still strangely reluctant to play the Kidlington Chess Congress. Round One: The very first game I ever played 1.d4 as White and it worked out very nicely. I got a decent opening position from the London System and managed to attack his King-side: a very confidence-boosting first Win. Officially at this point I had a 100% record with 1.d4! Round Two: Played Black. This was a very long game (well over three hours) where I felt like I had a slight edge for much of it, but unfortunately lost the thread towards the end and Lost while running out of time. Shame really, but I wasn’t too disappointed because I knew I’d still played very well and had found good moves at important junctures. My opponent made no real mistakes and deserved the win. Round Three: Another game as Black and this time I faced the London System from the opposite side. My preparation was helpful, because I was able to spot his opening inaccuracy and got the upper hand. It was never quite enough to win, though, and with time running out we ended up sharing the points. A little frustrated only to get a Draw here, simply because I’d felt positive all the way through: pleased not to have made any mistakes, though. Round Four: Day Two began as Day One: I’m playing White and start with 1.d4 The London System. I catch my opponent in an opening trap and win a knight within just 20 minutes: it then takes me nearly two hours to wrap it up! He played very well to make me work for it and, at one stage, I thought I’d messed it up. Finally got to an endgame where I had two very powerful bishops against a rook which proved decisive. Nice to start the day with another Win. My 100% record with 1.d4 remained intact! Round Five: Another game as White and, of course, another London System. Didn’t play this one quite so accurately and ended up with a very passive position, although never actually bad. It was a long struggle, again well over three hours. Finally fizzled out into a very hard-fought Draw and I was pleased to reach that conclusion. This game mirrored Round Three, except that on this occasion it was me on the defensive, not my opponent. My record with 1.d4 has now slipped to a mere 83% (2.5 out of 3)! So I finished on 3 out of 5, which is a good plus-score given that my rating pre-tournament was officially low enough for me to enter the lower-rated section. All five of my opponents this year had ratings in a narrow range 157 to 163 and my results give me a tournament rating of 169 which is, I think, the highest I’ve ever had. I awoke to the news yesterday morning with shock and upset. I voted Remain and genuinely thought Remain would win, that we’d all breathe a sigh of relief and move on. Instead, rather than this being the end of the campaign circus, it is instead the beginning of something more serious. Younger voters voted overwhelmingly to Remain and it’s their future lives that have been damaged, in my opinion. We have a heavily divided country right now and this needs to be addressed. I’m pleased and proud that my local city, Oxford, voted 70% to remain. A similar result (with strong majority to remain, these figures are approximate) happened in London (60%), Cambridge (70%), Bristol (60%), Bath (60%), Exeter (55%), Brighton (70%), plus strong pro-Remain votes in Scotland and Northern Ireland. While everyone’s vote must be respected, I believe that many people made their decision for the wrong reasons, especially (but not exclusively) on the Leave side. People who voted to see immigration reduced won’t see that any time soon, nor is it likely have any effect on those non-UK EU citizens already living here. (If it does have such an effect, i.e. some kind of of forced repatriation, then we’ve reached a very dark place indeed.) I also don’t believe that the “take back control” mantra, which admittedly was a superb campaigning tool, ultimately means very much. People in this country will only have control if the government can be elected to represent a majority of the people. If we end up with just a different bunch of elites, well that doesn’t get us very far. Many people have raised the issue that there was a large age effect on voting intention, as measured by opinion polls in advance of the vote. If one assumes this to have carried through to the vote itself, this means that younger voters were likely to vote Remain and older voters likely to vote Leave. Given that the true effects of this decision will not be felt for a number of years, it seems very unfair that we have been subject to a result where many of those voting for it will be least affected by it. At the same time, a positive voice I heard said that a grandparent asked her just-too-young-to-vote grandchild how she should vote, for exactly this reason. The negative campaign fought by the Leave campaign while undoubtedly effective, left me feeling very sour. It felt extremely anti-foreigner (sometimes sickeningly so) and ultimately very divisive. This was reinforced by the usual right-wing media into a relentless torrent of very unsavoury front page headlines blaming our ills on Them. Anything which exposes people to such a continual message of negativity is not healthy, in my opinion. Clearly this hit home with many voters, however. My further concern is that this media approach worked, in that Leave won, and thus there will be more of it in future now it’s seen to be effective. The Remain campaign was fought with logic and reason, on the whole. However, this was clearly not such an important message for some of the undecided voters. In fact from a campaigning point of view it may even have backfired: the Leave campaign fought against it by claiming directly that “people have had enough of experts”! I find that very sad and a very sorry reflection on the electorate as a whole. Both campaigns were very active on social media, as expected. In my own little bubble I had an almost continual feed of positive messages about Remain, which says as much about my choice of friends and online social contacts as anything else, I suppose. I’m aware others will have had their own bubbles on both sides. I’ve seen it pointed out that the argument in favour of Remain was a much harder one to engage with online, simply because an argument for the status quo is always difficult to get fired up about. The Leave campaign had a clear message, including the “take back control” rhetoric, which fit very well with the kind of viral online environment and was thus, ultimately, more successful. In my opinion: logic failed, emotion won. It’s uncertain what the vote to Leave means economically. I think that price rises and suppressed pay is quite a likely outcome. My work is in academic medical research: an area which has historically had a lot of EU funding, so that’s a concern. David Cameron carries a lot of responsibility for this result. His decision to hold the referendum, hoping simply that it would (one presumes) “make UKIP go away, make the Euro-sceptic backbenchers shut up” has backfired catastrophically. If David Cameron wanted a legacy, he’s got it: the break-up of the EU and, possibly, the potential break-up of the UK. In the end, the Referendum became about so much more than just the EU membership and that worked against him. He is correct to resign, although I’m unclear whether the timescale is correct. (As of the day I’m writing this, Cameron has said he expects to remain PM until October.) And I have divided opinion on whether I would like to see a Leave-campaigning person become PM, because it was what they wanted, they ‘won’, so they get to run the show leading to renegotiation. But at the same time I don’t personally want any of them in charge! The country is divided and already a lot has happened in immediate response to the vote. Scotland’s First Minister has said a new Referendum is highly likely and, I think, would likely succeed this time. In Northern Ireland, questions have been raised regarding a possible future outside the UK. Both these calls were in response to the UK’s vote to leave, yet in Scotland and Northern Ireland a majority voted to remain. So is there any scope for optimism? Well, perhaps. Caroline Lucas of the Green Party has made a fresh call for electoral reform, in effect asking politicians to honour the “take back control” message. I welcome her call and hope it leads to something, but I fear it will simply be lost in the noise of the post-Brexit chaos. In more general terms, any kind of constitutional reform should be seen as positive providing it doesn’t simply cement a new elite in post. I believe the best way forward is to do our best to fight against division and to work together in the best interests of everyone. That includes trying to heal the bad-feeling that has arisen between those who voted Leave and those who voted Remain and I’ll need to work at that as much as anyone! The annual gathering of chess aficionados in Kidlington was rather more traumatic than on previous years, due largely to my own poor play. It is also the first time I’ve ever seriously considered dropping out of such a tournament before the end. On balance, I’m glad that I didn’t do so, but the fact that it was on my mind probably didn’t help my play especially during the first game on Sunday. It’s also the first time I considered not doing a full blog write-up of the tournament, but instead just doing a one-liner consisting of a single, terse profanity. Round One: playing Black against the highest-rated player in the section (whose brother happens to be a grandmaster!) was tough. That said, I played very solidly and managed to survive long enough to make a decent effort. I miscalculated a lengthy tactical sequence which led to him having two bishops against a rook in the endgame, which was a formality for him to win. Shame to have Lost the first game, but I wasn’t too unhappy about my play here and my opponent was very complimentary. He went on to win the tournament, so no need to feel too ashamed about losing. Round Three: the Saturday evening game drew me as Black against Darrell Watson, who I’ve played here twice before (also both as Black) and I’ve beaten him both times. I felt confident I could make amends and get my first points on the board. I gave up bishop for knight early on and then aimed to close the position to take advantage of the material imbalance: this worked very well and by move 30 I broke through, winning a pawn giving me connected passed pawns. Tragically, I immediately missed a simple tactic and lost queen for two minor pieces and it was effectively Lost from that moment. I was so angry with myself and I’m sure my opponent heard what I muttered under my breath at that instant! I played on for a short while, just giving my opponent a chance to go wrong, but it wasn’t to be. Finishing the first day without any points and having just misplayed so horribly was very difficult. Before heading home I stayed at the venue for a while mulling over whether to just give up and withdraw from the tournament. With a score of zero out of 3, there was a very real chance that if there were an odd number of players left in the tournament for Round Four I’d be without a game anyway. My thought processes were rather muddled, but I was evaluating “You’ve got 0 out of 3, you might get 2 out of 5.” against “You’ve got 0 out of 3, you might get 0 out of 5” and so on. I decided not to withdraw and headed home for some sleep, although I didn’t sleep very well. Round Four: as the player with the lowest score in the tournament, I was pleased to see that I was not given a bye for this round and actually had an opponent. I played White against a chap who had lost his first two games too, but had taken a half-point bye for Round Three. I misplayed the opening (Hyper-accelerated Dragon) and got a very passive and poor position almost immediately. So there I was, 20 minutes after the game started, with 0 out of 3 and facing another lost position. My thoughts returned to withdrawing from the tournament, writing up the “one-line profanity” version of this blog post and so on. The game just didn’t seem to run in my favour and, despite thinking for a long time on several moves, I couldn’t find any way to get activity. I felt very demoralised at this moment. Eventually I couldn’t avoid losing a pawn. My opponent had strong central pawns, one of them a passed pawn, in a double bishop endgame. A stroke of luck in my favour was my opponent missing the strongest move and, although I was still losing, it gave me a glimmer of hope. I helped provoke a miscalculation on his part and he lost his extra pawn. The game looked drawn, but I only had three minutes (plus 15 second increment) on the clock. He played a move, then offered a draw: I had the suspicion he’d just noticed he’d made a mistake. This was indeed the case and the game simplified into a winning King and pawn endgame for me. It was a great relief to Win this game, after having spent around three hours believing I was lost. Points on the board at last! Round Five: the last game was against slightly lower-rated opposition and as Black I played an open version of the Caro-Kann Defence which I’d not tried before, but proved quite successful. He played a little inaccurately and I got the opportunity to play a spectacular exchange sacrifice, although once he’d recovered from the quite visible shock, he was able to come out of the situation just down one pawn by returning the material. Convinced I had a winning position, I thought for possibly rather too long looking for the key moves. He offered a Draw after I’d repeated the position once and I accepted. It turned out there was a way to make progress, but it would have been very difficult: even with two extra pawns in an opposite-colour bishop endgame would not have been a certain win. I was partly relieved to have avoided defeat, to be honest and having played both Sunday games without a loss was psychologically very positive. My final score of 1.5 out of 5 was of course not very impressive and my grade will drop for next year as a result: I’ve decided that even if it drops low enough to make me eligible for the Under-145 section, I’ll still play my ‘usual’ Under-180 section anyway. Better next year? Let’s hope so! UPDATE: Games and analysis available here. Well that was a bit of a shock, wasn’t it? The opinion polls got it wrong and we ended up with a Conservative majority government. Albeit one which only gained 37% of the popular vote. That is, 11.3 million people voted Conservative, while 19.3 million people voted for a different party. This should not yield a governing mandate: 37% of the vote led to 51% of the seats. However, given that the Conservatives have a Parliamentary majority as a result of the the discredited First Past The Post (FPTP) voting system, I don’t expect them to start singing and dancing about voting reform any time soon. Let’s be honest, though, FPTP really made some of these results look very silly indeed. More than 1 million people voted Green and they only got 1 MP; nearly 4 million people voted UKIP and they only got 1 MP. That’s appallingly undemocratic. Under a more proportional system, these two parties would have received about 25 and 80 seats respectively. It is right to be in favour of this even if one disagrees with, say, UKIP’s policies: if 4 million people vote for a party, they should have a very strong representation in Parliament. In Scotland, it was even worse. Almost exactly 50% of Scottish voters voted SNP: this lucky 50% saw SNP win in 56 of the 59 constituencies, that’s 95% of the seats! The other 50% of Scottish voters weren’t so lucky: their votes led to just 3 MPs, just 5% of the seats. Looking at the map, you’d think that everyone in Scotland voted SNP, when that’s clearly not the case. It’s worth adding, however, that the SNP are in favour of a proportional system for Westminster elections and it’s not their fault the current system benefits them so much. This is the fundamental failing of the results of FPTP: it exaggerates division and subtle differences. FPTP really, really has to go! It was undoubtedly a catastrophic election for the Liberal Democrats, but most party members I’ve seen express an opinion believe that it was the ‘right thing’ to go into coalition in 2010. It was sad to see some key players lose their seats: ministers who have done a good job over the past five years, such as Vince Cable and Danny Alexander in business and at the Treasury, and Lynne Featherstone and Jo Swinson who have done great work on equal rights. If electoral wipe-out was the price for implementing lots of liberal policies and curtailing illiberal plans from the Conservatives, then perhaps it was a price worth paying. I’m curious to see how David Cameron’s fairly small Parliamentary majority works in practice: it has the potential to become troublesome in future (c.f. John Major in 1990s) although I expect that in the short term there won’t be many rebellions from the Conservative benches. A small majority carries its own risk that the agenda may be steered by the extreme wings of the Conservative party. David Cameron may look back fondly on the Coalition’s majority of 70+! I certainly believe that the presence of the Liberal Democrats in government will be sorely missed. They implemented large parts of their manifesto and also kept the Conservatives in check when necessary. As I’m writing this post, the Liberal Democrats have announced that they have gained 10,000 new members since polling day, which is quite remarkable. There seems to be a very positive ‘fight back’ in place. I’ve been a member of the Electoral Reform Society for more than five years: they campaign continuously to reform voting systems in the UK to make them more democratic and fairer. As you’d imagine, they always have an awful lot to say regarding General Elections because of both their significance and the disproportionate results that arise. I’ve been a member of the Open Rights Group for two days although I’ve been following their activities for some time. I was motivated to join after news was announced that there was a plan to reintroduce the so-called Snooper’s Charter, which the Liberal Democrats had successfully and rightly ‘blocked’ in government. Sir Terry Pratchett died today. Ever since I was given a copy of ‘Mort’ by a University housemate in 1992, I was hooked on the Discworld books. I now own every single one. I’ve read all of them at least once, most of them twice and some of them several times. Terry Pratchett produced the most consistently funny, insightful and creative stories for over 30 years. The pace of his writing put other authors to shame. He churned out top quality novels, twice each year. They were always the first thing on my Birthday or Christmas list. “Latest Pratchett, Dave?”, I’d be asked and always nod eagerly in the affirmative. And it looks like we’ll be lucky enough to see one final Discworld novel from him, “The Shepherd’s Crown”, finished and due to be published later in the year. It’ll be on my Christmas list, as always. “Final Pratchett, Dave?”, I’ll be asked. I’ll still nod, of course, but rather more sadly. It’s no secret that I’m a proponent of electoral reform, in particular I’d like to see the ridiculous FPTP voting system replaced with a more proportional system, such as STV. However, we’re stuck with FPTP for now and it occurred to me that the best way to show that we need a change is to see messy results in the UK 2015 General Election and, in particular, how stupid some of the outcomes can be. With that in mind, I have drawn up a list of goals. These are outcomes I’d like to see which show up the bias, disproportionality and unfairness that FPTP brings. In short, the more messy and stupid the election results are, the worse it reflects on FPTP as a system. GOAL 1: I want to see a hung parliament. It goes without saying that any single-party majority government must not happen. PROBABILITY: Most current polls and projections indicate that this is highly likely. BONUS GOAL: I want to see a really hung parliament, where no two parties can form majority coalition, such as we have with the current government. Projections suggest this is certainly quite possible. GOAL 2: I want to see very obvious disproportionate results when considering the national share of votes and the national share of seats. For example, we expect to see Labour gain far more seats than its vote share should warrant, yet equally we expect UKIP and Greens to manage only a small handful of MPs between them despite sharing perhaps 20% of the vote. PROBABILITY: This is basically certain to occur, given that it’s a built-in failing of the FPTP system; BONUS GOAL: I want to see the election produce the ‘wrong’ winner, i.e. whichever party gets the most votes doesn’t get the most seats: probability of this is higher than at any other recent election and, if it happens, will likely manifest itself with Labour getting fewer votes than the Conservatives, but winning more seats; SUPER-BONUS GOAL: I want to see something really messy and stupid, for example: Firstly, Labour gets most seats, but fewer votes than the Conservatives; then Labour form a coalition with the Liberal Democrats where the Liberal Democrats have more seats but fewer votes than UKIP. Thus the teams that come 2nd and 4th in the popular vote form a governing coalition. Probability of that? Possibly quite slim, but it would provide a very anti-FPTP message. I am aware that this SUPER-BONUS GOAL is at odds with GOAL 1 ‘BONUS’ above! GOAL 3: I want to see many examples of low percentage winners in individual constituencies, demonstrating how badly FPTP works at a local level as well as when considered nationally. PROBABILITY: There should be no shortage of examples of this kind. Once again a chilly weekend in February heralds the annual Kidlington Chess Congress. Playing for the fourth year in the Under-180 section, I was looking to improve on last year’s 50% score. Round One: I was drawn against a slightly lower graded, but very experienced opponent (he has played 175 graded games in the past 12 months!) and I had White. It was a long game and fairly even although I felt I had a small edge. Just as we reached the 3.5 hour stage, and while both our clocks were below 5 minutes, he misjudged a Queen exchange to leave me with a clearly winning pawn endgame. Nice to Win in the first round! Round Two: My prize for winning the previous game was a game with Black against one of the strongest players in my section. I managed to keep the opening fairly solid, although I felt under pressure throughout the game. After three hours play we had only reached move 30 and I was down to under 3 minutes. Soon he was in time trouble too and we blitzed out a further 30 moves in the next 5 minutes! He missed an immediate win, but in the end it didn’t matter and he managed to play correctly to force a result in his favour shortly afterwards. Shame to have Lost such a long game, but I felt that I played well and have no real complaints about this one. Round Three: The evening game for the first day paired me with White against a stronger player. I deliberately played an unambitious opening in order to simplify quickly because I was tired from two 3.5-hours games earlier in the day, but he then played very strangely: after playing normally for the first 10 moves, he undeveloped nearly all his minor pieces which left me with a huge advantage in space and, eventually, his position was so cramped he had no good moves at all. I used this advantage to force a win of material and he resigned almost immediately. He could have played on for a bit, bishop or knight down, but presumably decided he’d had enough. Very pleased to Win this one and end the day on 2 out of 3. The game finished in under two hours as well, which is very fast for this type of tournament! Round Four: Day Two began with a game against a very strong and rapidly-improving 15-year-old boy. I played one of the new openings I’d been studying for when I play Black, but perhaps didn’t choose the best variation. He had a good advantage heading into the endgame and I lost a pawn. This would have eventually proved fatal if I’d just played ‘normally’ so I mounted a last-gasp “bayonet charge” against his king, which was unfortunately repulsed. Shame to have Lost, first time I’ve lost to a teenager since being one myself: but I was never graded this high at that time! Interestingly, in my post-match computer analysis I found that I’d missed an astonishing move which would have saved the game and forced a draw! We both missed this during the game and during the post mortem immediately after the game had finished. Pesky kids. Round Five: Going into the last round on 2 out of 4 I played White against another rapidly-improving child: although this one was only 10! It’s easy to be complacent saying “Oh, he’s only 10…” but I had to remember that he had also managed to get to the score 2 out of 4 against similar opposition as me. The game was very even but I managed to keep control enough to have a very tiny edge as we approached the endgame. He had been playing very fast, however: at the critical moment, I had only 14 minutes left against his 38 minutes. I had an opportunity to play for a win in a very uncertain, theoretical endgame: it was *probably* drawn, but I knew there was a very small chance of winning; equally, there were plenty of opportunities to go wrong and lose, quite likely in time trouble. He actually offered a Draw and I gladly accepted. The computer tells me that it was indeed possible to win but far from simple to do so. I think I made the best decision, pragmatically. Perhaps if I’d been in the running for a prize I might have been more tempted to play for a win, I suppose. 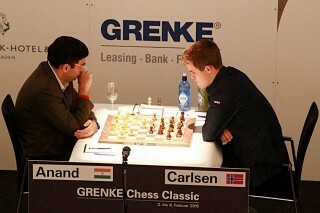 Vishy Anand and Magnus Carlsen were playing in the Grenke Classic in Germany while we played in Kidlington. Like last year I ended on 2.5 out of 5, giving me 50%: I suppose that’s pretty reasonable, but it would have been nice to have a win on the second day. Especially since the computer says I missed good moves in both those games. On the other hand, I won because of unforced errors in two other games, so maybe all this stuff evens out in the end. UPDATED 12.02.2015 My game analysis with comments is here and the full cross-table results for the U-180 section is here. Round One: Got off to a poor start playing inaccurately in the opening as Black; I never recovered from that and, with a further missed tactic later on, this was always going to be Lost. Round Two: For the third year running, playing Karl Biswas with White: got a good, solid position out of the opening and ground this one down to Win a slightly-better endgame. Round Three: Last game of the day saw me playing Black against a remarkably strong and mature 12-year-old boy. Although it nearly went pear-shaped in the opening, this one fizzled into a Draw. Round Four: Just like the first round, I mucked this one up right at the start by messing up the opening: as White against a strong opponent, I really should have done better here. I recovered enough to make a (long) fight of it, but – apart from hoping for errors from my opponent – this was destined to be Lost too. Round Five: Playing Black against Darrell Watson, who I played four years ago in the lower section. For once I got a reasonable position from the opening and, in trying a little too hard to play for a win, my opponent gave me some excellent chances. As the time ran down, I made a serious blunder which should have cost me the game, but my opponent missed it and the game should have been drawn. But my opponent returned the favour a few moves later, meaning I could finish with a Win. Overall I’m a little disappointed with my results this year: that’s the first year I can really say that so I probably shouldn’t complain. The games were very long (all over three hours except the first, with the last one being nearly three-and-a-half) so it was very tiring. Because of my performance and the length of the games, I spent a huge amount of game time feeling rather low about how I was doing. Although I ended up on 50% overall, I only snatched that in the last minute of the final round. Given that I scored higher last year against much stronger average opposition makes this year’s results look poor by comparison. Having said all that, it wasn’t a disastrous performance: two wins, one draw, two losses. My grade for the tournament was only about 140 (last two years it has been 160+), but that’s not a disgrace. I’m most disappointed about how I played in the openings, particularly. If there’s a lesson to be learned from this event, it’s that I need to learn some lessons about openings! Mistakes in the opening ultimately cost me both games I lost and perhaps prevented me from doing better in the drawn game. Learning to handle openings better will no doubt improve my play generally, although there’s a lot of time required to do this that I don’t really have. Beware future competitors of Kidlington 2015, I’ll be up for personal revenge! Final word of congratulations to local girl Zoe Varney who was joint winner of the lower Under-145 section with 5 out of 5. Worrying thing is, she might be in my section next year… !